Funny for the viewer, but not such a laugh for those involved, these crash videos have all been a big ‘hit’ on social networks. You have to feel sorry for forklift truck drivers involved. Fortunately, in each of these cases they escaped with only bruised pride. Taking something positive from these experiences, let’s think about how we can avoid such catastrophes in our materials handling operations. A sudden rush of speed, perhaps brought on by a sudden rush of blood to the head, turns a solid-looking racking system into a crumpled mess in seconds. Talk about a domino effect. Happily, we see the driver escaping unscathed by the end of the clip. Any gain in materials handling productivity achieved by driving forklift trucks fast in the warehouse simply doesn’t stack up when viewed against the cost of damaged stock. Slow down, and invest in physical protection or reinforcement of racking uprights – especially at the ends of aisles. The driver of this forklift truck clearly underestimated the width of the load. It doesn’t seem to strike the pallet racking at any great speed, but it’s enough to make it collapse like a house of cards. At least he has the presence of mind to make a run for it and avoid being under all that falling warehouse stock. It doesn’t take much to topple some racking systems. For forklift drivers, if there isn’t a colleague to guide you through a narrow gap, try measuring it against your load before you go. For warehouse owners, make sure you use good-quality racking materials and racking protection. Two forklift truck drivers make the same mistake here. Neither can see the other approaching. Just as well there were no pedestrians in their path. If your load obscures or, worse still, totally blocks your view, drive in reverse so you can see where you are going. If other lift trucks are working in the same area as you, make sure you know where they are and stay alert to their movements. When a car and a lift truck collide, it’s obvious which one will come off worst. As this car is pushed out through a doorway by three people, a passing forklift runs straight into it. All four participants in this scenario need to take a share of the blame. First of all, cars and forklifts don’t mix well. In an area used by both, extra caution is needed. It would certainly have made sense for one of the three car pushers to take a look outside before going through the doorway – just as you would if you were driving. To be on the safe side, a forklift driver passing an open warehouse door should be alert to the possibility that someone or something might exit through it at any moment. 5. Who put that column there? Everything seems pretty normal in this warehouse scene until a forklift driver, with acres of space to spare, inexplicably accelerates into what looks like a roof-bearing girder. On a positive note, the upright stands up to the impact so there is no resulting downfall. 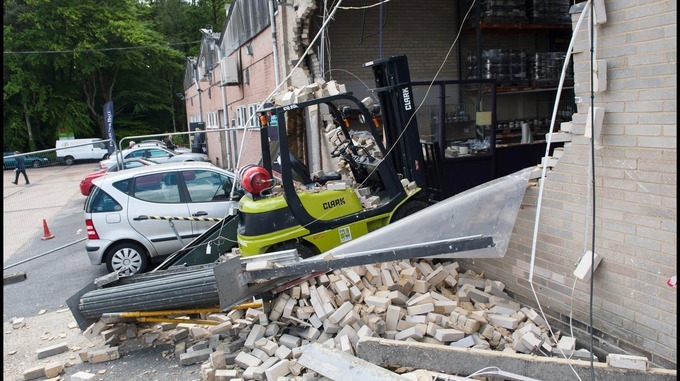 Always use appropriate speed and don’t risk damaging your lift truck, warehouse structures, stock and people for the sake of saving a few seconds. In this case, it wouldn’t be a bad idea to paint the uprights luminous yellow or make them more obvious in some other way. Oh, and did you notice that the driver wasn’t wearing a seatbelt and seemed to fall out of the truck? If the crash had caused his truck to tip over, he might well have been crushed by it- be safe and invest in appropriate driver training. 6. Who put that pole there? Could the driver of this large telehandler have been distracted by the presence of two TV personalities involved in an interview? For some reason, he’s totally unaware of the pole right in front of him. Given that pedestrians are around, he should be concentrating especially hard. Beware of distractions and pay special attention to your surroundings when in an area used by pedestrians. Fork Truck Direct is a company supplying forklift purchase, hire, and parts in Essex, and across the South East of England.